Sorting people into groups is something that we, as scholars, spend a lot of time doing. 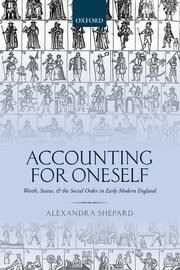 As Alexandra Shepard shows in her powerful recent book, Accounting for Oneself, it is something that early modern people constantly did too. This is not the place for proper review of the book as there are already plenty of those available, including a substantial analysis by my co-blogger Mark. However, I would like to look slightly more closely at one particular aspect of the book which speaks directly to an issue that we have struggled with repeatedly on this blog: how do we divide up early modern society?